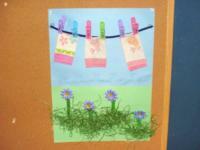 A springtime collage that doubles as a fine motor skill activity. 1. Gather your material. 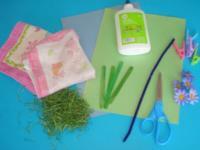 You will need blue and green construction paper, grass-like straw (or Easter straw), scissors, a pipe cleaner, fabric or paper flowers, green Popsicle sticks, small clothespins, old facecloths, and white glue/hot glue. 2. 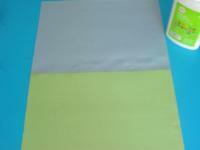 Glue the blue construction paper on the green construction paper, overlapping approximately 5 cm. 3. 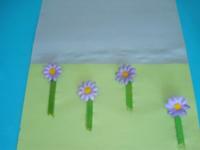 Break the Popsicle sticks and glue them here and there on the green construction paper to represent flower stems Glue a fabric/paper flower on each stem. 4. 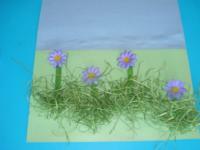 Glue your grass-like material around the flowers. 5. 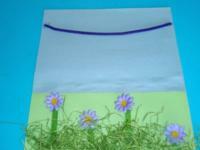 Glue the pipe cleaner horizontally on the blue construction paper to represent a clothesline (applying glue only to the ends). Use of hot glue is recommended for this step. 6. Cut three tiny rectangles in the old facecloths. They will become towels that can be hung on the clothesline. 7. Display your collage on a bulletin board. 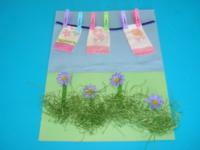 Invite children to hang the miniature towels on the clothesline using the clothespins. 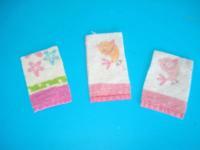 If you wish, you can cut out several tiny towels of different colors. Children will enjoy hanging them out to dry from time to time. Use the clothesline to explore color identification, counting, patterns, etc.